Also using a FTU mask from one of the awesome Creative Misfits, Tonya (DevilishAngelMaskbyTonya-vi). Click HERE to grab the pack! 1. Open up new image size 800 x 800. Drag and drop your tube of choice into the canvas. Since we're adding the tube now, it's also a great time to get your copyright layer put in. 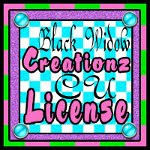 Include the copyright symbol, artist's name, website and your license number if applicable. Double click on this layer and name it copyright in the layers box. Add drop shadow to elements, go up to FILTERS>LIGHT & SHADOW>DROP SHADOW with settings at 2/2/6. Add perspective drop shadow to tube by choosing PERSPECTIVE instead of DROP SHADOW and use settings as shown. Slide opacity over to 60 in layers box on shadow layer. 3. Use the magic wand (fuzzy select tool) and click within the center of the frame. SELECT>GROW by 2 then click on the paper 2 layer to activate it within the layers box. Go up to SELECT>INVERT and EDIT CLEAR. Now the paper is within the center of frame, should be near the bottom of the layers box, with other papers below. 4. Drag and drop mask into the canvas, scale to 675 x 675 then go up to COLORS>INVERT then LAYER>TRANSPARENCY>COLOR TO ALPHA. R click on the mask layer in layers box, ALPHA TO SELECTION then L click on paper 10 to activate it in layers box, go up to SELECT>INVERT and EDIT>CLEAR now the paper is the mask layer. You can delete original mask layer. 5. Drag and drop the WA into the canvas, go up to COLORS>INVERT then add perspective with same settings as before. 6. Add your text to the tag, I am using a font called Impact Label Reversed in white sized at 80. Then I right clicked on the text layer in layers box, ALPHA TO SELECTION, click on paper 5 layer to activate, SELECT>INVERT and EDIT CLEAR. For the text, I went up to FILTERS>BLUR by 5 x 5. Place this behind the paper, add perspective to this layer as well. I then made a second text layer using the font called Digs My Hart in Red sized 63 then right clicked, ALPHA TO SELECTION, SELECT>SHRINK by 2, SELECT>INVERT and EDIT>CLEAR. Then I used the scale tool to make the heighth of this text shorter and the width a bit longer. Drop shadow 1/1/1 in black.